RS Aggarwal (2015) Solutions for Class 10 Math Chapter 1 Real Numbers are provided here with simple step-by-step explanations. These solutions for Real Numbers are extremely popular among class 10 students for Math Real Numbers Solutions come handy for quickly completing your homework and preparing for exams. All questions and answers from the RS Aggarwal (2015) Book of class 10 Math Chapter 1 are provided here for you for free. You will also love the ad-free experience on Meritnation’s RS Aggarwal (2015) Solutions. All RS Aggarwal (2015) Solutions for class 10 Math are prepared by experts and are 100% accurate. What do you mean by Euclid's division algorithm. Euclid's division algorithm states that for any two positive integers a and b, there exist unique integers q and r, such that a = bq + r, where 0 ≤ r < b. A number when divided by 61 gives 27 as quotient and 32 as remainder. Let the Dividend be x. Hence, the required number is 1679. 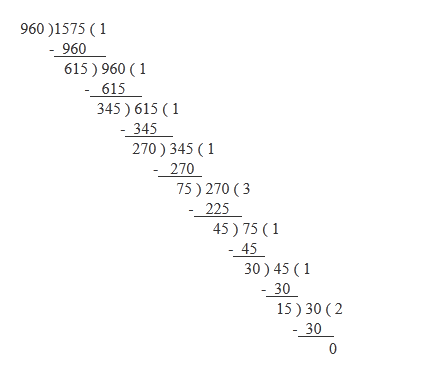 By what number should 1365 be divided to get 31 as quotient and 32 as remainder? Let the divisor be x. Hence, 1365 should be divided by 43 to get 31 as quotient and 32 as remainder. Hence, the HCF of 2520 and 405 is 45. Hence, the HCF of 1188 and 504 is 36. Hence, the HCF of 960 and 1575 is 15. The HCF of two numbers is 23 and their LCM is 1449. If one of the numbers is 161, find the other. ​Let the value of a be 161. Hence, the other number b is 207. The HCF of two numbers is 11 and their LCM is 7700. If one of the numbers is 275, find the other. Let the value of x be 275. Hence, the other number y is 308. 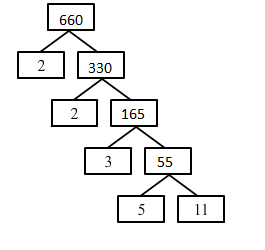 Find the largest number which divides 378 and 510 leaving remainder 6 in each case. We know that the required number divides 372 (378 − 6) and 504 (510 − 6). Therefore, the HCF of 372 and 504 is 12. Hence, the required largest number is 12. 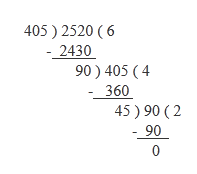 Find the largest number which divides 320 and 457 leaving remainders 5 and 7 respectively. We know that the required number divides 315 (320 − 5) and 450 (457 − 7). Therefore, the HCF of 315 and 450 is 45. Three pieces of timber 42 m, 49 m and 63 m long have to be divided into planks of the same length. What is the greatest possible length of each plank? The lengths of three pieces of timber are 42 m, 49 m and 63 m, respectively. We have to divide the timber into equal length of planks. Hence, the greatest possible length of each plank is 7 m.
Find the greatest possible length which can be used to measure exactly the length 7 m, 3 m 85 cm and 12 m 95 cm. Hence, the greatest possible length is 35 cm. Find the maximum number of students among whom 1001 pens and 910 pencils can be distributed in such a way that each student gets the same number of pens and the same number of pencils. Hence, 91 students receive same number of pens and pencils. Three sets of English, Mathematics and Science books containing 336, 240 and 96 books respectively have to be stacked in such a way that all the books are stored subject wise and the higher of each stack is the same. How many stacks will be there? Hence, we made stacks of 48 books each. Find the leash number of square tiles required to pave the ceiling of a room 15 m 17 cm long and 9 m 2 cm broad. Three measuring rods are 64 cm, 80 cm and 96 cm in length. Find the least length of cloth that can be measured an exact number of times, using any of the rods. Length of the three measuring rods are 64 cm, 80 cm and 96 cm, respectively. Hence, the required length of cloth is 9.6 m.
The traffic lights at three different road crossing change after every 48 seconds, 72 seconds and 108 seconds respectively. If they all change simultaneously at 8 hours, then at what time will they again change simultaneously? The traffic lights at three different places changes after every 48 seconds, 72 seconds and 108 seconds, respectively. An electronic device makes a beep after every 60 seconds. Another device makes a beep after 62 seconds. They beeped together at 10 a.m. At what time will they beep together at the earliest? Hence, they will beep together again at 10 : 31 a.m.
Six bells commence tolling together and toll at intervals of 2, 4, 6, 8, 10, 12, minutes respectively. How many times do they toll together in 30 hours? Six bells toll together at intervals of 2, 4, 6, 8, 10 and 12 minutes, respectively. Hence, after every 120 minutes (i.e. 2 hours), they will toll together. We know either 2 or 3 is not a factor of 11, so it is in its simplest form. Hence, the given rational is non-terminating repeating decimal. We know 2, 3 or 5 is not a factor of 73, so it is in its simplest form. We know 2, 5 or 7 is not a factor of 129, so it is in its simplest form. We know either 5 or 7 is not a factor of 9, so it is in its simplest form. We know 2, 3 or 5 is not a factor of 11, so 1130 is in its simplest form. We know either 3 or 7 is not a factor of 32, so it is in its simplest form. We know 7 is not a factor of 29, so it is in its simplest form. We know 5, 7 or 13 is not a factor of 64, so it is in its simplest form. We know either 2 or 5 is not a factor of 23, so it is in its simplest form. Moreover, it is in the form of (2m×5n). Hence, the given rational is terminating. We know 5 is not a factor of 23, so it is in its simplest form. Moreover, it is in the form of (2m × 5n). We know either 2 or 5 is not a factor of 171, so it is in its simplest form. Moreover, it is in the form of (2m ×5n). We know either 2 or 5 is not a factor of 15, so it is in its simplest form. We know either 2 or 5 is not a factor of 17, so it is in its simplest form. We know either 2 or 5 is not a factor of 19, so it is in its simplest form. Get reason to support your answer. (i) 53.123456789 is rational because it is terminating. 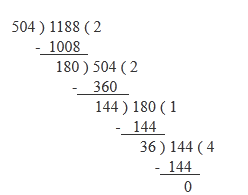 (ii) 31.123456789 is rational because it is a repeating decimal. (iii) 0.12012001200012... is not rational because it is non-terminating and non-repeating decimal. Define (i) rational numbers (ii) irrational numbers (iii) real numbers. Rational numbers: The numbers of the form pq where p , q are integers and q ≠ 0 are called rational numbers. Irrational numbers: The numbers which when expressed in decimal form are expressible as non-terminating and non-repeating decimals are called irrational numbers. Real numbers: The numbers which are positive or negative, whole numbers or decimal numbers and rational number or irrational number are called real numbers. Example: 2, 13, 2, −3 etc. (i) 227 is a rational number because it is of the form of pq , q≠ 0. (ii) 3.1416 is a rational number because it is a terminating decimal. (iii) π is an irrational number because it is a non-repeating and non-terminating decimal. (iv) 3.142857 is a rational number because it is a repeating decimal. (v) 5.636363... is a rational number because it is a non-terminating, repeating decimal. (vi) 2.040040004... is an irrational number because it is a non-terminating and non-repeating decimal. (vii) 1.535335333... is an irrational number because it is a non-terminating and non-repeating decimal. (viii) 3.121221222... is an irrational number because it is a non-terminating and non-repeating decimal. (ix) 21 = 3 × 7 is an irrational number because 3 and 7 are irrational and prime numbers. (x) 33 is an irrational number because 3 is a prime number. So, 3 is an irrational number. (i) Let 6 = 2 × 3 be rational. Hence, 2, 3 are both rational. This contradicts the fact that 2, 3 are irrational. The contradiction arises by assuming 6 is rational. (ii) Let 2 - 3 be rational. Hence, 2 and 2 - 3 are rational. This contradicts the fact that 3 is irrational. The contradiction arises by assuming 2 - 3 is rational. Hence, 2 - 3 is irrational. (iii) Let 3 + 2 be rational. Hence, 3 and 3 + 2 are rational. This contradicts the fact that 2 is irrational. The contradiction arises by assuming 3 + 2 is rational. Hence, 3 + 2 is irrational. (iv) Let 2 + 5 be rational. Hence, 2 + 5 and 5 are rational. This contradicts the fact that 5 is irrational. The contradiction arises by assuming 2 -5 is rational. Hence, 2 - 5 is irrational. (v) Let, 5 + 32 be rational. Hence, 5 and 5 + 32 are rational. The contradiction arises by assuming 5 + 32 is rational. Hence, 5 + 32 is irrational. (vi) Let 37 be rational. This contradicts the fact that 7 is irrational. The contradiction arises by assuming 37 is rational. (vii) Let 35 be rational. This contradicts the fact that 15 is irrational. So, if 15 is rational, then 155 is rational. The contradiction arises by assuming 35 is rational. (viii) Let 2 - 35 be rational. Hence 2 and 2 - 35 are rational. The contradiction arises by assuming 2 - 35 is rational. Hence, 2 - 35 is irrational. (ix) Let 3 + 5 be rational. This is impossible because right-hand side is rational, whereas the left-hand side is irrational. Hence, 3 + 5 is irrational. Prove that 13 is irrational. Since a, b are non-zero integers, ba is rational. Thus, equation (1) shows that 3 is rational. This contradicts the fact that 3 is rational. The contradiction arises by assuming 3 is rational. (i) Give an example of two irrationals whose sum is rational. (ii) Give an examples of two irrationals whose product is rational. (i) Let (2 + 3), ( 2 - 3) be two irrationals. (ii) Let 23 , 33 be two irrationals. (i) The sum of two rationals is always rational. (ii) The product of two rationals is always rational. (iii) The sum of two irrationals is an irrational. (iv) The product of two irrationals is an irrational. (v) The sum of a rational and and irrational is irrational. (vi) The product of a rational and an irrational is irrational. Counter example: 2 + 3 and 2 - 3 are two irrational numbers. But their sum is 4, which is a rational number. Counter example: 23 and 43 are two irrational numbers. But their product is 24, which is a rational number. What is the largest number that divides each one of 1152 and 1664 exactly? What is the largest number that divides 70 and 125, leaving remainders 5 and 8 respectively? We know the required number divides 65 (70 − 5) and 117 (125 − 8). What is the largest number that divides 245 and 1029, leaving remainder 5 in each case? We know that the required number divides 240 (245 − 5) and 1024 (1029 − 5). Hence, HCF of 1095 and 1168 is 73. If the HCF of 65 and 117 is of the form (65m − 117), then m = ? A number when divided by 143 leaves 31 as remainder. What will be the remainder when the same number is divided by 13? So, the given number is in the form of 143x + 31, where x is the quotient. Thus, the remainder will be 5 when the same number is divided by 13. Every positive even integer is in the form of 2m. Let m be a positive even integer. On dividing m by 2, let q be the quotient and r be the remainder. Let n be the given positive odd integer. On dividing n by 2, let q be the quotient and r be the remainder. Thus, when n is odd, it is in the form of n = 2q + 1. (n2 - 1) is divisible by 8 if n is an odd positive integer. We know that an odd positive integer n is of the form (4q + 1) or (4q+ 3) for some integer q.
which is clearly divisible by 8. If a and b are positive integers such that a = x3y2 and b = xy3, where x, y are prime numbers, then HCF (a, b) = ? If p and q are positive integers such that p = ab2 and q = a3b, where a, b are prime numbers, then LCM (p, q) = ? We know p and q are positive integers. If a = (22 × 33 × 54) and b = (23 × 32 × 5), then HCF (a, b) = ? (14, 35) is not a pair of co-primes because it has a common factor 7 other than 1. (18, 25) is a co-primes because it has only common factor 1. (31, 93) is not a pair of co-primes because it has a common factor 31 other than 1. (32, 62) is not a pair of co-primes because it has a common factor 2 other than 1. The HCF of two numbers is 27 and their LCM is 162. If one of the numbers is 54, what is the other number? A positive integer n, when divided by 9, gives 7 as remainder. What will be the remainder when (3n − 1) is divided by 9? Let q be the quotient. So, when (3n − 1) is divided by 9, the remainder is 2. So, the decimal expansion of the rational number will terminate after two decimal places. So, the decimal expansion of the number will terminate after four decimal places. Which of the following rational numbers is expressible as a now terminating repeating decimal? We know 2 and 5 are not the factors of 1351. So, the given rational is in its simplest form. And it is of the form (2m × 5n) for some integers m , n.
So, the given number is a terminating decimal. We know 2 and 5 are not the factors of 2017. So, the given rational number is in its simplest form. So, the given rational number is a terminating decimal. We know 2, 3 and 5 are not the factors of 3219. Hence, 32191800 is not a terminating decimal. Thus, it is a repeating decimal. We know 5 is not a factor of 1723. And it is not of the form (2m × 5n ). Hence, 1723650 is not a terminating decimal. Product of non-zero rational and an irrational number is always an irrational. For example, let 2 and 2 be rational and an irrational number such that their product is 2 × 2 = 22, which is an irrational number. It is a rational number because it is a repeating decimal. It is an irrational number because it is a non-terminating and non-repeating decimal. 3.141141114 is an irrational number because it is a non-repeating and non-terminating decimal. π is an irrational number because it is a non-repeating and non-terminating decimal. 2.35 is a rational number because it is a repeating decimal. It is a repeating decimal, hence a rational number. Since it is non-repeating and non-terminating, it is an irrational number. 25 is an irrational number. Proof: Let 25 be rational. Hence, 5 is an irrational number. It is an irrational number. Proof: Let 23 be rational. Hence, 3 is an irrational number. 12 is an irrational number. 1236250 is a terminating decimal. The rational number pq is a terminating decimal, if q= (2m × 5n) for some whole numbers m and n.
(a) Both Assertion (A) and Reason (R) are true and Reason (R) is a correct explanation of Assertion (R) is a correct explanation of Assertion (A). (b) Both Assertion of Assertion (A). q = (2m × 5n), where m , n are whole numbers. Hence, both Assertion (A) and Reason (R) are true and Reason (R) is a correct explanation of Assertion (A). 124249is a non-terminating, repeating decimal. The rational number pq is a terminating decimal if q = (2m × 5n) for some whole numbers m and n.
(b) Both Assertion (A) and Reason (R) are true but Reason (R) is not a correct explanation of Assertion (A). We know 7 is not a factor of 1242; so, it is in its simplest form. Moreover, it is not of the form (2m × 5n). 8 is an irrational number. If m is a natural number which is not a perfect square, then m is irrational. (b) Both Assertion (A) and Reason (R) are true but Reason (R) is not correct explanation of Assertion (A). So, Reason (R) is a correct explanation of Assertion (A). The HCF of two number is 9 and their LCM is 2016. If one of the numbers is 54, then the other is 306. Let the two positive integers be x and y. Hence, Assertion is false and the Reason (R) is true. We know that 2, 3 or 5 are not factors of 71. So, it is in its simplest form. Hence, it is a non-terminating, repeating decimal. Which of the following has terminating decimal expansion? We know 2 and 5 are not factors of 19, so it is in its simplest form. Hence, 1980 is a terminating decimal. On dividing a positive integer n by 9, we get 7 as remainder. What will be the remainder if (3n − 1) is divided by 9? So, when (3n − 1) is divided by 9, we get the remainder 2. Show that any number of the form 4n, n ∈ N can never end with the digit 0. If 4n ends with 0, then it must have 5 as a factor. But we know the only prime factor of 4n is 2. Also we know from the fundamental theorem of arithmetic that prime factorisation of each number is unique. Hence, 4n can never end with the digit 0. The HCF of two numbers is 27 and their LCM is 162. If one of the number is 81, find the other. Let the two numbers be x , y. Hence, the other number y is 54. Examine whether 1730 is a terminating decimal. We know that 2, 3 and 5 are not the factors of 17. So, 1730 is in its simplest form. Hence, 1730 is a non-terminating decimal. Find the simplest form of 148185. Hence, the simplest form is 45. Which of the following numbers are irrational? (a) 2 is irrational (∵ if p is prime, then p is irrational). (b) 63 = 23 × 33 is irrational. (c) 3.142857 is rational because it is a terminating decimal. (d) 2.3 is rational because it is a non-terminating, repeating decimal. (e) π is irrational because it is a non-repeating, non-terminating decimal. (f) 227 is rational because it is in the form of pq , q ≠ 0. (g) 0.232332333... is irrational because it is a non-terminating, non-repeating decimal. (h) 5.2741 is rational because it is a non-terminating, repeating decimal. Prove that 2+3 is irrational. Let (2 + 3) be rational. Then, both (2 + 3) and 2 are rational. The contradiction arises by assuming (2 + 3) is rational. Hence, (2 + 3) is irrational. Find the HCF and LCM of 12, 15, 18, 27. Give an example of two irrationals whose sum is rational. Let (2 + 2) and (2 - 2) be two irrational numbers. Sum = (2 + 2) + (2 - 2) = 2 + 2 + 2 - 2 = 4, which is a rational number. Give prime factorisation of 4620. Find the HCF of 1008 and 1080 by prime factorization method. Find the HCF and LCM of 89,1027 and 1681. Find the largest number which divides 546 and 764, leaving remainders 6 and 8 respectively. We know the required number divides 540 (546 − 6) and 756 (764 − 8), respectively. Hence, the largest number is 108. Prove that 3 is an irrational number. Let 3 be rational and its simplest form be ab. Then, a, b are integers with no common factors other than 1 and b ≠ 0. Let a = 3c for some integer c.
Thus, 3 is a common factor of both a, b. But this contradicts the fact that a, b have no common factor other than 1. Show that every positive odd integer is of the form (4q + 1) or (4q + 3) for some integer q. Let a be the given positive odd integer. On dividing a by 4,let q be the quotient and r the remainder. Thus, when a is odd, it is of the form (4q + 1) or (4q + 3) for some integer q. Show that one and only one out of n, (n + 2) and (n + 4) is divisible by 3, where n is any positive integer. Let q be quotient and r be the remainder. Case 1​: If n = 3q, then n is divisible by 3. Case 2: If n = (3q + 1), then (n + 2) = 3q + 3 = 3(3q + 1), which is clearly divisible by 3. In this case, (n + 2) is divisible by 3. Case 3 : If n = (3q + 2), then (n + 4) = 3q + 6 = 3(q + 2), which is clearly divisible by 3. In this case, (n + 4) is divisible by 3. Hence, one and only one out of n, (n + 1) and (n + 2) is divisible by 3. Show that 4+32 is irrational. Let (4 + 3√2) be a rational number. Then both (4 + 32) and 4 are rational. This contradicts the fact that 2 is irrational (when 2 is prime, 2 is irrational). Hence, (4 + 32 ) is irrational.